2. Once a month, max. Yes, yes, the young gorgeous French women at the centre of this lesbian love story do indeed get very naked and very racy. You won’t believe me when I tell you these very long and very voyeuristic bedroom scenes are in fact a shame. They detract from what is great about the movie. Also, there are other places to go online for rather graphic depictions of carnal acts, you know, or so I've heard. The bedroom stuff is sandwiched between over two and a half hours of a heartbreaking and supremely real love story. Adele, the protagonist of this French story (French title “La Vie D’Adele – why do they feel the need to change titles in translation?) is reminiscent of Natalie Portman when she was young, and not just because she is so easy on the eyes. There is a rawness to this young woman's performance that is really quite breathtaking. The kind of acting Johnny Depp hasn’t gotten in touch with in years. The film is smart, like art, like a great novel. Beautiful and real and just everything I love in a movie. Kinda blue but highly recommend. Erik Larson has a rare gift. Leonardo DiCaprio knows this. He bought the rights to this book five years ago. An Italian fellow, goes by the surname Scorsese, is set to direct, and soon. Which is why I've rushed to recommend it. Before you have Hollywood's casting decisions creating the character images for you. If the podcast "Serial" turned you onto how compelling true crime can be, I assure you the winner of the 2004 Edgar for True Crime, not to mention a finalist for the National Book Award, is as good as nonfiction gets. Erik Larson’s gift is that he can turn what has to amount to months, if not years of research, into narrative so suspenseful and character-driven as to read like an excellent novel. For perspective I’m currently reading my third Larson (about the Lusitania). "Devil in the White City" is the true story of the architect tasked with designing the Chicago’s World Fair in 1893, at the same time as it is the story of one Doctor H.H. Holmes, a serial killer so devious and brilliant as to have had to be an inspiration for Thomas Harris’ Hannibal Lecter. Minor spoiler alert: he builds a hotel near the world’s fair with the sole purpose of using it as a place within which to kill and kill horribly. It's a tale as much steeped in the power politics in America at that time, the major players, the big builders, alongside a sociopathic genius of a madman. I sincerely don’t mean to link exclusively to New Yorker articles, and certainly not the latest that anyone frequenting their site would be familiar with, but this was too good. It comes in response to that fascinating piece in the nytimes a few weeks back about the less than desirable working conditions at Amazon. Once upon a time, it was taken for granted that the wealthier classes enjoyed a life of leisure on the backs of the proletariat. Today it is people in skilled trades who can most find reasonable hours coupled with good pay; the American professional is among those subject to humiliation and driven like a beast of burden. Those two sentences alone just blew me away. I mean, it’s something we all know, and that many of us live, but it’s a head scratcher if you start to think about it. Why are the upper-middle classes the ones now working themselves to death? As I understand it, the world for devout Christians is divided between the era before Christ and the era after. In much the same way my Jewish agnostic world is similarly divided, between the era sans-children and the era now. All this to say I’m not sure I’d have ever been much for podcasts, but having little kids means you spend your long weekends at parks and birthday parties and Dufferin Mall, which is lovely! but when you get that moment to wash dishes you cherish hell out of it because it's when you can set up you little speaker and listen to interesting people chat about interesting things. For my parents and the three other people not familiar with Louis CK, it’s probably safe to say he’s been the top American comic for the last half decade or so (with Amy Schumer now hot on is heels). Enough said. Mark Maron, also a comic, comes across over radio like a nebbish Jew. His voice is nasal and unapplealing. He’s funny, to be sure, but not that funny. And he often rambles. Thing of it is his interviews (WTF is his show) wind up being amazing. Because he is not a pro, because he is “one of them” (he generally interviews entertainers), because he reveals of himself, he gets his subjects to open up in ways even Jian Ghomeshi might have envied. And he and C.K. 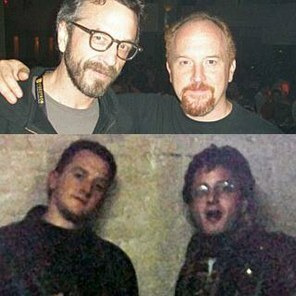 have known each other since they were nobodies (see pic). If the beautiful gloss of Hollywood is the only reason you go to the movies … which is to say, if you only ever want your television and film dramas to be cast with Friday Night Lights level beautiful people, please skip to number six. For everyone else, there's Mike Leigh. I don't envy the English their food, but man does that little island clearly provide the best acting training in the English speaking world. They're also so commendable for continuing a tradition of hiring people not simply because they look good. And Mike Leigh is famous the world over for the work he does (extensive improvised scenes) with some of England's best. Like all the great director's movies “Another Year” is real people with real struggles. It is about one of my favourite themes in all storytelling, the battle to make the right choice, between happiness and misery. And what I love most about this story, is that unlike some of the Mike Leigh’s earlier films the ultimate message is, I believe, one of hope.